ESA's Mars Express will skim the surface of Mars' largest moon Phobos on Wednesday evening. Passing by at an altitude of 67 km, precise radio tracking will allow researchers to peer inside the mysterious moon. 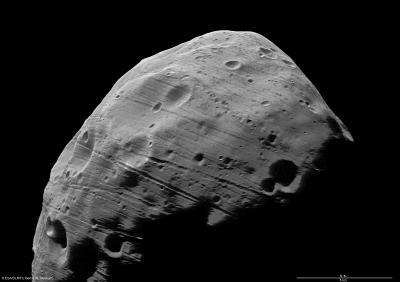 Mars Express is currently engaged in a series of 12 flybys of Phobos. At each close pass, different instruments are trained towards the mysterious space rock, gaining new information. The closest flyby will take place on 3 March at 21:55 CET (20:55 GMT). From close range, Mars Express will be pulled 'off-course' by the gravitational field of Phobos. This will amount to no more than a few millimetres every second and will not affect the mission in any way. However, to the tracking teams on Earth, it will allow a unique look inside the moon to see how its mass is distributed throughout. How will the ground teams make these tremendously sensitive measurements? Ironically, they will turn off all data signals from the spacecraft. The only thing that the ground stations will listen out for is the 'carrier signal' – the pure radio signal that is normally modulated to carry data. A slight 'over performance' during a manoeuvre last week had put the spacecraft on a trajectory that included an occultation by Phobos. This meant that Mars Express would pass behind Phobos as seen from Earth. As this would jeopardise the tracking measurements, it was decided to perform another manoeuvre to position the flyby at a slightly higher altitude than originally planned. After the closest flyby, the work is not over. Mars Express will sweep past Phobos a further seven times before the campaign is complete. In addition to the tracking experiment, known as MaRS for Mars Radio Science, the MARSIS radar has already been probing the subsurface of Phobos with radar beams. "We have performed a preliminary processing of the data and the Phobos signature is evident in almost all the data set," says Andrea Cicchetti, Italian Institute of Physics of Interplanetary Space, Rome, and one of the MARSIS team. The camera, HRSC, will be used on the 7 March flyby, when Mars Express passes over the daylight side of Phobos at an altitude of 107 km, and will continue to be used during all the subsequent flybys, obtaining high-resolution images of the moon's surface. The other instruments will also get their chance to work. ASPERA is already studying the way charged particles from the Sun interact with the surface of Phobos. SPICAM, PFS, OMEGA are characterising the surface of the moon, with PFS also aiming to measure the temperature of Phobos' day and night sides. HRSC will pay particular attention to the proposed landing site for the Russian Phobos-Grunt mission, which is expected to launch in 2011/12. "All the experiments on Mars Express have something to say about Phobos," says Olivier Witasse, Mars Express Project Scientist, ESA. This is a bonus for science, considering that none of them were originally designed to study Phobos the moon, only Mars the planet. The science results from these flybys are expected in subsequent weeks or months, when the various teams have had time to analyse the data.